Herring fish belong to the family Clupeidae, which contains nearly 200 species. They are small, streamlined schooling fish that feed on plankton and live in both freshwater and saltwater. Herring have a single dorsal fin and protruding lower jaws and are silvery in color. 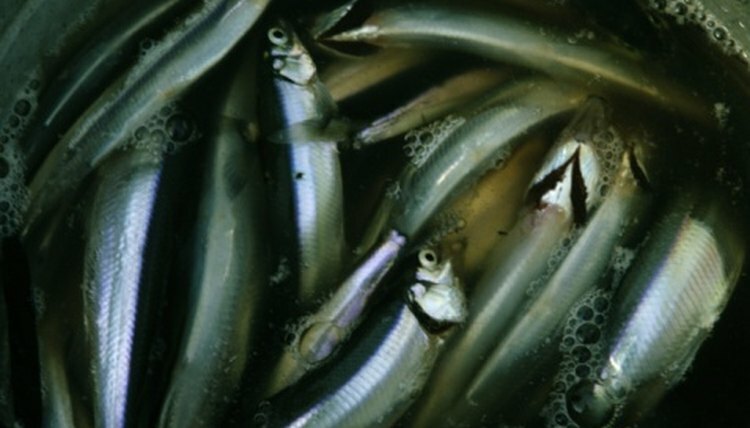 Bodies of herring are relatively deep while the sides are flat, according to the Gulf of Maine Research Institute. Atlantic herring are small, pelagic plankton-feeders, up to 17 inches long and weighing up to 1.5 lb., according to the Gulf of Maine Research Institute. Features include a dorsal fin located around the top center of the body, iridescent grayish or greenish-blue colors in the dorsal area and silver colors on the sides and abdomen. Abundant populations of herring in the Gulf of Maine make them one of the most important fish species in that region, according to the Institute. While once considered to be a separate species from the Pacific herring, Atlantic herring have since been acknowledged to have only minor differences. Blueback herring make their home along the Atlantic coast of North America, from Nova Scotia to Florida. Resembling alewife, a closely related species, they are either silvery or dark blue in color. Bodies are flat on the sides and rounded on the abdomens with forked tails. Bluebacks reach a maximum length of 16 inches and a weight of 7 oz. Though a saltwater fish, they also dwell in freshwater rivers and lakes and are one of the most common fish species in the Hudson River Valley, according to the U.S. Geological Survey. Alewife herring are native to the Atlantic coast from Canada to South Carolina, though they enter Pennsylvania’s Delaware River on spawning migrations, according to the Pennsylvania Fish and Boat Commission. Alewives were first reported in the Great Lakes in the 1870s and reside there still. Alewives have an overall silvery color with cream-colored abdomens that might display light spotting. They grow between 12 and 15 inches in length, and their large, metallic scales come off easily, according to the Maryland Department of Natural Resources. Shad are a type of herring that comes in a variety of subspecies, such as hickory shad, which grow from 18 to 20 inches in length, have a protruding lower jaw and are amber-silver in color. American shad grow between 20 and 24 inches in length and are silvery-colored with a few large spots on the shoulder area. Gizzard shad are set apart from other herrings with their gizzard-like stomachs, according to the Pennsylvania Fish and Boat Commission. A gizzard shad’s back is silvery-gray, while its sides reflect silvery red, blue, green or brassy colors. Gulf of Maine Research Institute: Herring Biology: What Is a Herring?